Birmingham Race Course, is located in Birmingham, Alabama. Opened in 1987, at a cost of around 80 million dollars it was a state of the art facility. It had a one mile dirt oval, with a seven furlong inner turf course, that was sodded to make opening day, but was never ever used. The grandstand was a seven story structure that seated 5,200 on four levels. There was the trackside level, which had it's own stand alone restaurant, the Doncaster, which held 1,000. The next level was the grandstand where most of the seating was. Another level held the Newmarket Room which was reserved for private functions. Then came the clubhouse, which featured the Ascot dinning room, with room for 500 diners. On top of all that, was the Saratoga level, with the Longchamp room, an exclusive area for members and guests. The stable area had 1,200 stalls and there was ample parking. Was this place in Alabama or England? On the evening of March 3, 1987 the elite of Birmingham came out to the track, they were serenaded by the Birmingham Symphony Orchestra, on their way to the Saratoga Room for a champagne toast. Sparing no expense, they even got Bill Shoemaker, to come out and ride. 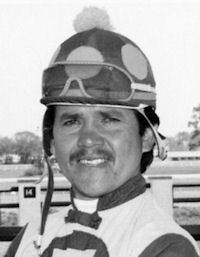 In the opener his horse took the lead, but tired in the stretch, the favorite Queen Alexandra, Omar Londono up, was the winner. From that day it was all downhill. In 1988, the track did not open and the first mention of dog racing came up. In 1989, racing returned, but with the kiss of death, a name change. Now known as Birmingham Race Course, the symphony was replaced with ads on black and country radio stations, the champagne replaced with beer, welcome blue collar workers. The change seemed to work, the race season was extended through the end of the year, but was it real? The racing season in 1990, kicked right off in January, but in May another bad sign, purse cuts. The track did finish out the year, but once again racing was done. The highlight of 1991 was a Guns and Roses concert. The track came back from the dead in 1992, but it was going to the dogs. In October of that year dog racing debuted at Birmingham Race Course and it would never leave. In 1993 the horses did return, but in June, horses and dogs started running on the same card and that's how it would be until July of 1995, when horse racing finally ended. 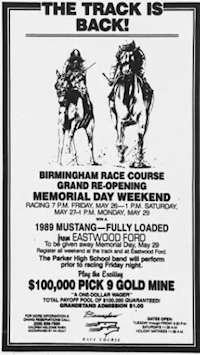 Birmingham Race Track is still in existence today. I did make it there when the dogs were running. I have been to quite a few dog tracks, but don't think I've seen a bigger one, nor have I heard a symphony orchestra, but I do remember back in the day a lot of dog tracks played some sort of march music during the post parade. The one thing I know for sure, I never saw anyone drinking champagne at the dogs!. In 2011 there was an effort made to return thoroughbred racing to Birmingham. It doesn't appear to have gained much traction. Ironically there was a turf course at Birmingham Turf Course, but it was never used. Larry Collmus, who is the track announcer at Churchill Downs and the voice of the Breeders Cup got his first regular assignment at Birmingham. Top trainer Steve Asmussen, also started out with a string of horses at Birmingham. Fact or fiction? The story goes that on the second day of operation the track ran out of programs and one of the managers suggested they just use the ones from the day before!